I have always been a fan of a good blazer. I remember when I was younger (circa 2005) I went through an 80's blazer faze. I would rock the thrifted blazers with a tank and skinny jeans and kitten heels. Still to this day I can appreciate a statement blazer. 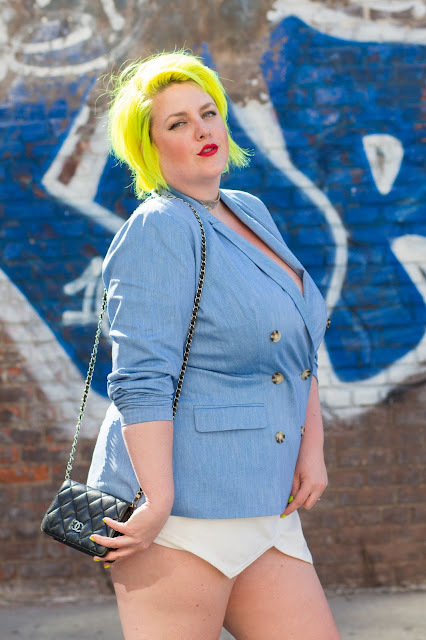 I love this double breasted size 16 Eloquii blazer because it not only fits great but I am super into the chambray material. Believe it or not, when shopping thrifted blazers there are generally at least one or two awesome 1980's finds with power shoulders in a larger size range. Excitingly enough there are a few plus size brands supplying blazers in fashionable cuts. For this look I wanted pair the awesome double breasted number with a simple white skort and animal print sandals. I added a silver chocker to glam up the look a bit. Tip: When all else fails look for a stretch blazer and skirt combo to accommodate your curves. Click through to see my picks! ….